Farmers harvest their crops in the Democratic People’s Republic of Korea. 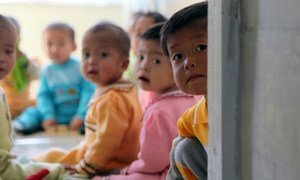 A new assessment by the United Nations has found that harvests in the Democratic People’s Republic of Korea (DPRK) are up for the third year running, but warns that chronic malnutrition persists. Although rates of child malnutrition have steadily declined over the past 10 years, rates of stunting caused by malnutrition during the first 1,000 days of a child’s life remain high and micronutrient deficiencies are of particular concern, the Food and Agriculture Organization (FAO) and World Food Programme (WFP) said in a joint news release. The Crop and Food Security Assessment Mission carried out by the two Rome-based agencies visited all nine agricultural provinces in late September and early October around the main annual cereal harvest. It found that total food production is estimated at about 5.03 million metric tons in 2013 – about a 5 per cent increase over the previous year. However, the food security situation is still “unsatisfactory” with 84 per cent of households having borderline or poor food consumption. “Despite continued improvement in agricultural production, the food system in the DPRK remains highly vulnerable to shocks and serious shortages exist particularly in the production of protein-rich foods,” said Kisan Gunjal, FAO economist and co-leader of the mission. Since 1998, WFP has partnered with the Government to produce blended fortified foods and nutritious biscuits for children and pregnant or nursing women. The agency has recommended a shift to a new product – rice soya milk blend – for children in nurseries to reduce stunting and wasting. The United Nations today said $98 million is urgently needed to address critical humanitarian needs in the Democratic People’s Republic of Korea (DPRK), where some 2.4 million people need regular food assistance.